Well, yesterday was my birthday. You know you're a farm girl when you are given. . . a pink feed pail, Power Punch, calcium drench, goat treats, and 30 & 65 cc syringes for your b-day :)! Plus some jeans, a hat, and flowers, and I'm probably forgetting something ;). This is going to be short because I can't type really well right now. I just got back from riding with my cousin and brothers, and the horse I was riding got a bit crazy on me. I had to pull on her reins to "shut her down", and I think I either sprained or broke my finger. . . we'll see. The weather is so nice lately. . . I think the cold is finally over with! The goats are all doing great. I think we are milking about 22, twice a day now. Hopefully I can milk with both hands tonight! Since we are getting so much milk, I've been making butter and cheese, and my Mom made Feta for the first time - yum! Tired of typing ;). . . see ya' later! Well, I have not done many posts lately because there is really not that much to update on. We've all been sick for the past week, so everyone has just been hanging out. It snowed quite a bit Friday-Sunday, then it warmed up, and then it rained a lot last night. The weather here in Oklahoma is just crazy!! We are now down to only 8 bottle babies. . . 6 doelings, 1 buckling, and 1 doeling that is leaving tomorrow. Glad to have somewhat of a break. I am not sure if my FF that is due in April is even bred. She doesn't look very big, and doesn't really have an udder either. We'll see. I guess I don't have much to say right now. . . more later! A sign of warm weather coming soon!!! Well, it's time for an update. I've been busy and sick the past few days. Tuesday one of our Boer/Nubian does, "Buttermilk", kidded to a buckling and doeling. Beautiful little kids. The buckling is a paint with a lot of white, and the doeling is pure white. At first I thought she was albino, but then decided not as she does not have red eyes but has blue eyes! I really have no clue where she got the blue eyes from as it is not in her lines. I think she is just so cute though. Now, we have a break from kidding! I am so glad to have a break. Right when most people are just starting kidding, I am pretty much ending ;). I have one first freshener due around mid-April, and then nothing till August when I have 2 does due (since I just bred them). Anyway, a break is very nice! We are now milking about 20 does, 2x a day, and getting a lot of milk. We also have 7 Mini Nubian doelings (we are keeping 6), 1 Alpine buckling (keeping him), two 75% Boer bucklings and two 75% Boer doelings (for sale, but maybe sold). All those are bottle kids. For dam raised kids, we have 5 Boer doelings and 2 Boer bucklings on their moms. The weather has been SO nice lately! And now they are calling for snow tomorrow night and Sunday. . . I thought winter was over with! We'll see ;). Time to go. Have a good evening! Okay, well, she is not really hairless, but she used to be! Yesterday we were given a LaMancha/Nubian doe that is about a year old, that kidded about a week ago. She is not registered, but comes from great milk lines and a CAE free herd. The lady that gave her to us got her along with a few other goats, and then this doe lost most of her hair. She treated her for lice, but we think it may have been due to hormones. After she had her kids, everything went back to normal. So, except for the hair on her tail and backbone, almost all of it has grown back but it is not thick - that'll take time. She has a very nice udder and is super easy to milk. I'll have to get pics of her udder later. The name she came with I don't care for, so we are trying to come up with another name for her. Any ideas are welcomed!! Right now we have come up with Eagle (Bald Eagle... we're so mean! ), Dolphin, Susie... can't think of any others that we have come up with yet. Why those names, I don't know ;). BUT, any ideas would help, thanks! Another kidding. . . Monday morning at 1:45am, Mom woke me up saying Verona had one kid. So I went down there, and she had one buckling out already. A little black guy with white ears and tan trim. A few minutes later she had a brown and white buckling with blue eyes. Easy kidding, and we were back in bed within 45 minutes! On another note, my website is SO outdated. I really need to update it, but the external hard drive that has all of my stuff on it, it looks like it finally has died for good. So, I am going to have to redo my website which will take some time. . .
For does due, the only 2 that are left (I think!) are Buttermilk, a Nubian/Boer bred to Ace, due any day. Her udder filled up last night, so I am thinking it'll be today or tomorrow. And then Maple Nut, a Mini Nubian first freshener that is due around April 10th or so. Then nothing till August, hopefully!! Aruba, one of our Alpine does, kidded late Wednesday night. . . it was actually early Thursday morning, the 11th. She had two big, beautiful bucklings, and a very easy birth. I was hoping for a doeling, but oh well ;). She was bred to a registered Alpine buck before we bought her, so these are his kids. the first buckling, the bigger one. He is chololate with white, and my Mom wants to keep him :)! The other buckling. His coloring is called "cou blanc", and he is for sale. Anyone looking for a great herd sire that comes from very nice milking and show lines, this may be the buckling for you! Then when we were going out to feed after milking, we heard a doe yelling in the barn, and one of the Boers, Mini Moette, was pushing a kid out. She had a big, cute doeling with a dark brown head. . . sire is Ace. Among all these kiddings, you'd think we're crazy (maybe we are, LOL! ), but we bred 2 more does!! 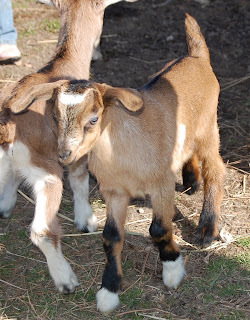 Both of these are Nubian does - Northwest Goats Little Prissy (PB doe) I bred to one of our Mini bucks, Quiet Wyatt; and Good Goats Baby Ruth (reg'd grade doe) we bred to our Boer buck, Ace. Prissy will be due August 1st, and Baby will be due August 7th. So, after the "last" doe due, in April, we'll have a few months break :). Today we sent Bill, the male llama, off to be sold. He just was not working out with the goats. He used to be fine, but now that he is almost a 3 year old, things started to change. He would chase the goats away and keep them separated from the 2 female llamas - exactly what we DON'T want. So, we started keeping him closed up, and since we don't breed llamas, we don't need to be feeding him and having him take up pen space. So, off he went. Not much else to update one. . . have a good day! Well, yesterday morning when we went and got the milkers, one of the crossbred meat does had 2 doe kids in the barn! All dry and nursing. The mom is all black, the sire is our Boer buck Ace, and the kids are pure white! She is a great momma also. . . when we went out to get the milkers, all of the does were out of the barn standing quiet a ways from it, and when Mom walked in with one of the dogs to see what was going on, the doe came running at them! She's calmed down a bit now, but is still a good momma. She is also one of the herd queens :). Then this morning one of my brother's high-percentage Boer does kidded to a buckling and doeling. . . out of Ace, also. At the moment, we are planning on keeping 6 doelings. . . I think way too many!!! Right now we have Snickers, Fatty Matty, Drama Queen, Moment, and Cookie Doe. Then the little doeling out of Blueberry we plan on keeping also. We are calling her "Blondie" right now, and they all want to name her "Blond Bombshell". . . any other ideas? She has soo long of ears for being out of a Nigerian sire! Blueberry, her dam, is 75% Nubian/25% Nigerian. I think we may end up keeping one more doeling if Aruba (the Alpine, who we bought bred to a reg'd Alpine buck) has a doeling, then I probably will keep her... but no more after that!! The weather has been very nice lately. We have been keeping all of the animals off of the pasture so it can rest, and when things start growing again, they can get a head start before the animals come through and eat everything up. So, the does have been hanging out around the house and in the yard lately. Oh also, if anyone is looking for a intact male llama that is about 3 years old, we are looking to get rid of ours. 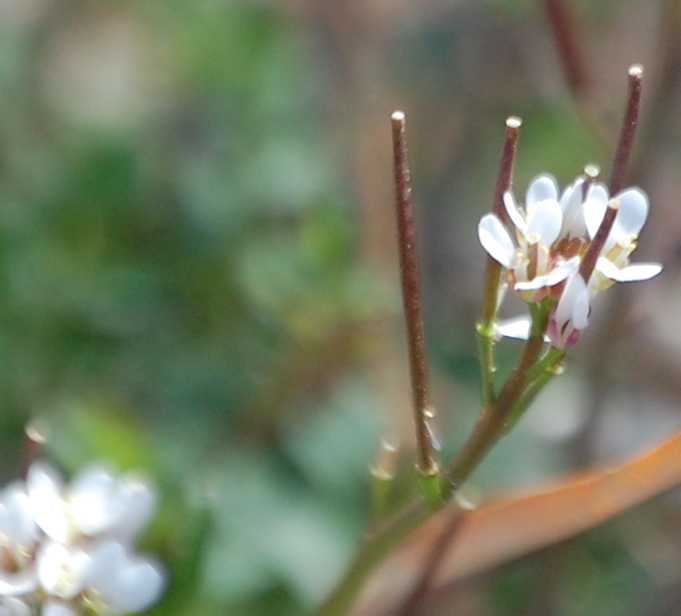 Shepherd's Purse is an herb that is used to slow down bleeding. You can buy it at this link. Several years ago, my mother was hemorrhaging after she gave birth to one of my siblings. Thankfully we had the Shepherd's Purse tea made up. She drank it, it stopped her bleeding within a minute and saved her life. Had it not been for that, I do not think she would be here today. With the doe that had a hemorrhage after kidding the other night, we had the Shepherd's Purse tincture on hand. Once we realized what was happening, I ran for the bottle and gave her a lot of it. The bleeding stopped very quickly, and she is acting like a normal goat. I always want to have it on hand! Here are some pictures of all the new kids born over the past few days, in order of them being born. It's been a busy past few days! Friday around noon we came home from helping down the road, and my little yearling Mini doe, Frenchie, who was not suppose to be bred, was licking a kid off! I was relieved because I thought she may have problems kidding, but I guess not. It was a little 3 lb doeling. Frenchie is milking pretty well for how tiny she is. . . I feel like I am milking a kid! They are both doing good though. Saturday morning Reata, a Boer/Nubian doe, kidded to a beautiful buckling and doeling out of our Boer buck, Ace. The buckling is a redish-blond and the doeling is a light paint. Since we milk Reata, we pulled the kids as usual and bottle fed them. The buckling was about 7 lb and the doeling was about 5 lbs. Saturday evening is when things got crazy. . . it was the most traumatic kidding I've ever had! A first freshener Boer doe had been going into labor all afternoon. Around 8pm she had some mucus. After a bit, we realized things were not progressing as they should. I went "in" to check her out and her cervix was only big enough for 2 of my fingers to barely fit in, and I could feel a hoof back there. I realized we were dealing with Ringwomb - a condition where the cervix does not dialate by itself, that I have been reading about for years and dreaded to ever have to deal with. Just so I don't have to write a whole lot again, here is what I wrote right after everything calmed down. "Well, in the 6 years that we have been doing goats (& lots of kiddings), that was the worst and most traumatic kidding I think I have ever dealt with!! We gave her Oxytocin and I manually dialated her cervix, probably for about 30-45 minutes (on and off, and time flies by when you're busy!). Anyway, I finally got it much bigger and the kid was right there ready to come out. She was now pushing, and the kid's feet were out and the nose was right there, and it's tongue was starting to go purple. Every time she would push we could see the whole ring of the cervix - it was yellowish/whitish. I was still helping stretch the area, and then the kid came out. It was ALIVE (after over 2 1/2 hours of being in the birth canal and the sack being broke), to our amazement - and a little doeling!!! Immediately after the kid came out, the mom started bleeding like I've never seen before. It looked like someone was pouring a jug of blood there - it was gulping out. I ran and got the Shepherd's Purse tincture, and a good friend (who's not "farmy"!) started putting counter-pressure in her. I gave her a ton of Shepherd's purse, and her tongue was going white. Within a minute, the bleeding subsided and the color came back to her! She started licking her kid and acting great for what just happened! I never want to be without Shepherd's Purse!! I gave her a bunch of Karo and sugar water, injectable B and probiotics. She is now eating grain and hay and nursing her kid! I also started her in Penicillin, gave her Banamine, and a calcium drench just to boost her." Today, both Momma and baby are doing surprisingly well! Then this afternoon, Blueberry, a first freshener Mini Nubian doe, went into labor and kidded to a beautiful blond doeling. The sire is SQSW Berry Blast, my Nigerian buck. The doeling has super long ears and is very cute! Pictures of all these new additions will have to come later. Grandma Maggie is doing great, and I think she realized she is a goat again as she is willingly hanging out with them all! I'm sure there is more to update on, but for now, I am going to eat my ice cream & cake (for my little brother's birthday, today) :). Finally, some pictures of Journey and her two kids. Not the best pictures as they wanted to follow me around, and that is why Journey's picture is through the fence ;). . . the only way to get a photo of her without someone holding her for the picture. This girl is a bit shy, but is getting very friendly now that she is taking the bottle well! We are calling her "Socks". . .
Well, poor Grandma Maggie is just having one problem after another. A few days ago she went "off" and had a super high temp (106). I gave her Banamine and started her on Excenel, thinking it was some kind of pneumonia due to all the weather change. Then Tuesday I noticed one side of her udder was *super hot* and swollen, and she was giving hardly any milk at all (especially out of that side). Poor girl, I wished I had found it sooner! Oh well. We got some ToDay mastitis treatment tubes and started treating that side, and I massaged Peppermint Oil (in Coconut oil) all over her udder - she actually liked that part ;). She was not eating her grain and just a bit of hay. I felt so sorry for her, but was doing all I could. I've been doing the ToDay treatment twice a day, followed by massaging her udder with the Peppermint oil, and it seems to be getting way better. She is drying up, but that is fine with me. Her appetite is coming back for her grain, and today she's been out with some of the does that are due, right out back, and is grazing some, eating hay and enjoying the sunshine! I am so glad she is doing much better! Speaking of sunshine. . . the weather has been really nice lately, praise the Lord! Well, it's been awhile since I last blogged, and that is because I have been busy! Busy with hay and goats. . . when am I not busy with those two things?? Willa's kids are both now at their new homes. Her buckling went to a young lady and her family who have a few other goats, just as pets, and he will be partly a house goat while he is small. Willa's doeling, also went to a pet home but she is going to be potty trained and live in the house! She was such a sweet and small little doeling, I am so thankful she went there. Thank you Rebecca for giving her a good home!! On the other hand, we got 2 more kids and a doe yesterday. We paid for the two kids (both does!) and her owner kindly gave us the doe so she will have a good home. Thank you very much Talena and family! The doe is an Alpine (unregistered), named Journey, and the two doelings are Nubian/Alpine. They were also just born last Monday (the 22nd), but they are so big - I am used to MINI kids :). Since they were being dam-raised, today I pulled them off her and am starting to bottle feed. So far, so good, and Journey seems to be doing just fine without them. I will have to get some pictures of them and post them. The two girls still need names. . . when I post pics, ideas will be welcomed ;)! The next round of prego does are almost ready to pop. Aruba (Alpine) is on day 144 today and back in the kidding stalls. She is bred to a registered Alpine buck. And Blueberry, a Mini Nubian first freshener is on day 140 today. On the bad news side of things, a few weeks ago I noticed that one of my yearling does from last year, Frenchi, was looking very wide. Didn't think much of it. Then last week I looked at her and she has an udder! Not good, as I did NOT want her bred. Obviously she must have been in heat when the bucks broke in one of those times last year, and I didn't know it (I luted the does that I thought were in heat 12 days later). Oh well, all according to God's plan. I just really, really hope it was not the Boer that bred her and that her kidding goes well. She is 14 months old, so not bad, and she IS as big as Willa (which I guess isn't saying much since Willa is small, LOL!). And since I have not posted about the llamas in a long time. . . they are definitely strange animals but, they are doing good ;). This is not a llama, but how can I leave out a picture of cute little Miss Molly? I think that is it for now. Have a good day! Here are a few (of many!) pictures that my sister took the other day of the 5 little doelings playing outside. Drama Queen getting ready to JUMP. . .
. . . and now flying little miss Drama!